Snow, sleet and freezing rain fell throughout Central Massachusetts on the day before Thanksgiving. Snow, sleet and freezing rain fell throughout Central Massachusetts on Wednesday, creating a sloppy mess for drivers and last minute Thanksgiving shoppers. But public works officials did what they could to keep the roads clean. It was cold, wet and slippery on the streets of Worcester Wednesday, as crews tackled the job of keeping them clear and people tackled the idea that winter has arrived. "I don't mind it, but I wasn't ready for it," said Juan Cruz of Worcester. Snow, sleet and freezing rain left a sloppy mess for drivers in Leominster, Massachusetts. "We've been stockpiling salt and materials for a couple of months now," said Matthew Labovites of the Worcester Department of Public Works. 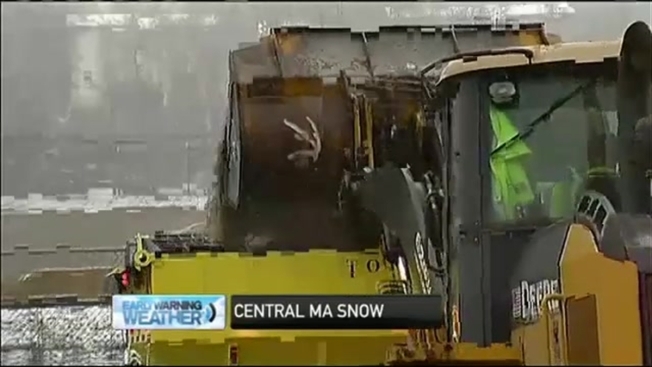 In the northern part of Central Massachusetts, drivers said the roads were messy. "It needs to stay all snow, I don't like ice, I don't like rain this time of year, it's just too much so snow is much better, I don't care if we have three feet," said Leominster resident Tammy Melanson. "It's kind of sudden, honestly, but I was kind of surprised it turned to sleet," said Priscilla Smith of Leominster. "I wasn't expecting that but it's – the roads are not great, the car in front of me was sliding a little bit, I had to drive pretty slow for most of the evening." Smith says she wouldn't have headed out in this weather if she didn't have to. "My oven's not working, so I have to pick up an apple pie for my family tomorrow before Thanksgiving," she said. Whether it was errands or holiday travel that had people out and about Wednesday, it was slow going pretty much everywhere. "It’s alright if you know how to drive in this weather," said Chris Melanson of Leominster. "Just take it easy, take it safe, we all live in New England, we've all got to expect this weather." "Other people have been real cautious, you know they're going really slow which is a good thing but you still have a couple people who don't know what they’re doing," added Nicho Perez of Leominster. And while some weren't ready for winter weather driving, others - like Rhonda Wallis, who works at Ocean State Job Lot - needed a little help stocking their cars with winter gear. 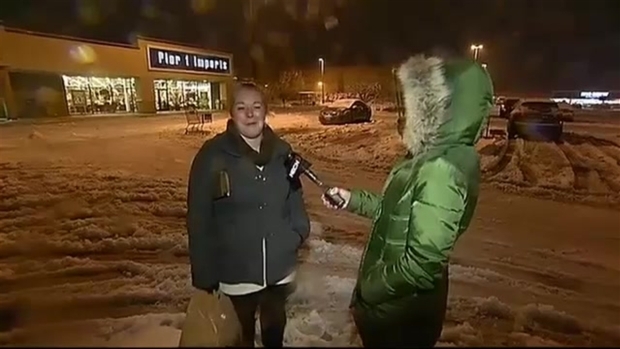 "I just think it's too early, too soon and it’s too cold," said Wallis, who was able to get a snow scraper at work. "I’m always all set yes, I actually have a cart with a shovel in it as well that I’m taking home with me."